April, 2016 - We have plenty of news on latest Landlordy app update (version 1.6, available in the App Store) and we hope these changes will make Landlordy more useful and enjoyable for you. 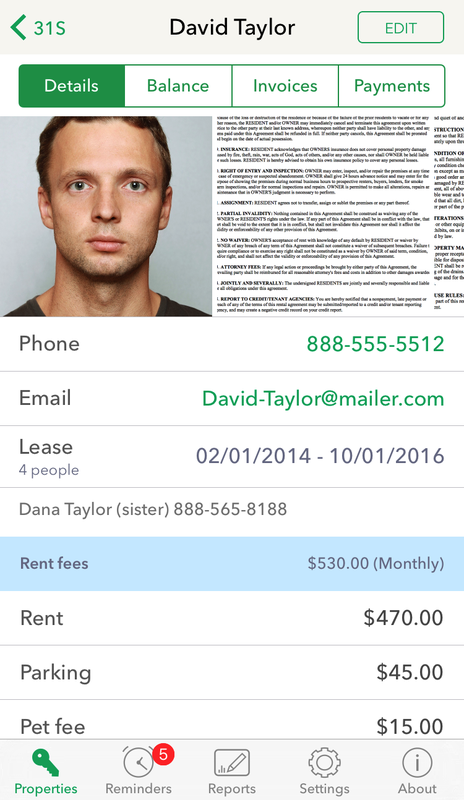 We added new tenant details screen with all relevant tenant information, including tenant phone and email, photos, lease details, fees and notes. You can also edit tenant/agreement details from there. What's important - you can quickly email/call/message your tenant from tenant details screen if you tap on tenant email or phone. Additionally – in the tenant/agreement edit screen tenant name, email and phone will be filled automatically if you will choose tenant name from your address book (Contacts.app) and relevant details in the address book is filled. Version 1.6 adds printing support (on AirPrint supported printers) for reports (for summary cash flow report as well as detailed reports for tenant income and expense categories) and tenants balance statement (ledger with all tenant invoices, payments and monthly balance history). We also added improved sharing support for these reports - you can save report .pdf file on Dropbox, email to yourself, send via Messages or WhatsApp or any other iOS app that have .pdf file support. Another sharing improvement - when you share payment receipt or rent invoice, you'll have quick share options via email or message with tenant email/phone already filled in (if you have added tenant phone/email in the tenant details screen). Previous Landlordy app versions used photos links from your Photo Library, but did not copy images themselves into the app. This decision was made to use space on your devices most effectively (because photos are usually backed up by iCloud anyway and only those you need would be present on your device). Unfortunately this approach led to misunderstanding when people have deleted photo (e.g. of the receipt) from the Photo Library and only after some time found out that image disappeared from the Landlordy app as well. Other people just did not want to mix business related photos of invoices with photos of their family in their Photo Library. Since version 1.6 all photos you take or attach to Landlordy will be automatically copied to Landlordy app folder. It means that Landlordy app size will become (much more, especially with time) bigger because of these photos, but you will be able to delete images you don't want to see in your Photo Library (like expense receipts) without loosing them in Landlordy app. We did our best to make sure app transfer all existing related photos to Landlordy without your involvement, but please make sure that everything works and back up data (using Settings-Backup data) first before you jump to clean your Photo Library from these receipts. If something does not quite work, please let us know on support@landlordy.com. You can now add rent payments with 0 (zero) amount to keep track on bounced tenant checks. 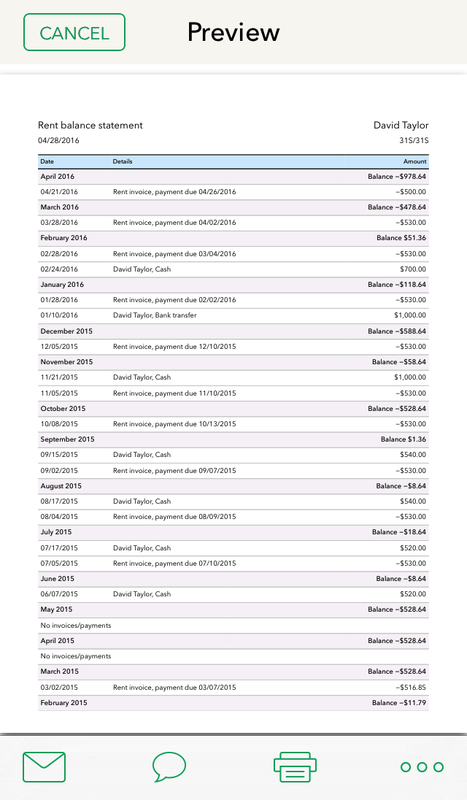 Recommended approach is to create separate payment category for these checks for making them obvious in the reports. We significantly improved app performance. If you have more than 10 rental units you should will feel the difference. This was bigger update that we initially planned, it almost feels like version 2.0, right? If you want to tell us something, share a story or suggest a feature - feel free to email us. We love to hear from our users.